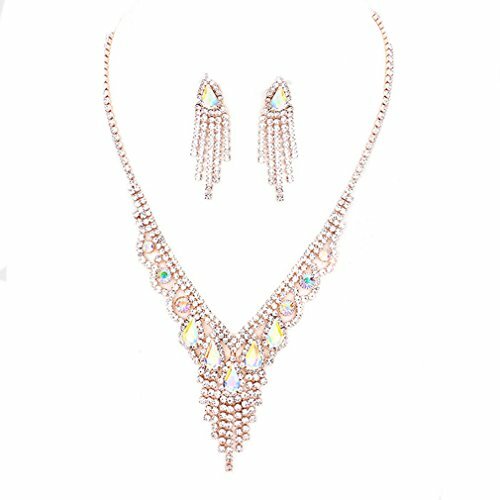 Elegant AB Crystal Rhinestone Rose Gold Women Necklace Jewelry Earrings Set Prom Bride Pageant by Affordable Wedding Jewelry at SCRHI. MPN: RN18001-RG-AB. Hurry! Limited time offer. Offer valid only while supplies last. Gorgeous sparkling Ab Teardrop cluster design rhinestone crystal pavé necklace and marching pierced post earrings set. Elegant Costume jewelry. Necklace Length: 16" + 4" extension chain, Drop size: 2", Pierced post matching chandelier earrings: 1.75"
If you have any questions about this product by Affordable Wedding Jewelry, contact us by completing and submitting the form below. If you are looking for a specif part number, please include it with your message.